This existing section of the trail runs behind the Bridgton Community Center, a perfect place for kids to hike and explore. The Stevens Brook Trail is a two-mile path between Highland Lake and Long Lake in Bridgton, Maine. The trail follows the Stevens Brook as it meanders through downtown Bridgton past scenic and historic natural areas. The Stevens Brook Trail offers easy to moderate terrain. Hiking boots or sneakers are recommended for most trail sections. Poison ivy grows in a few trail areas, so long pants are also recommended. Because this is a river trail, sections may be flooded when water levels in the Stevens Brook are high, so plan accordingly. The Stevens Brook Trail was made possible through the cooperation of many private landowners. Please take appropriate care to respect property. Carry out all trash, including pet waste. Dogs on leashes are welcome. An old granite foundation provides a glimpse into Bridgton’s mill history. The Stevens Brook provides wildlife habitat for a variety of Maine creatures. As you walk the trail, look for evidence of beavers, moose, and mink. Scan the ground for the tracks of raccoon and deer. Listen to the variety of bird songs. Enjoy the rich vegetation that lines the banks and helps keep the river clean. If you look closely, you are likely to be transported back to an era when Bridgton was a thriving mill town. 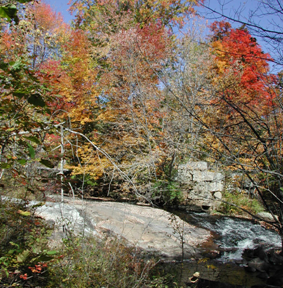 Granite foundations, turbines, and railroad tracks indicate that the Stevens Brook was once an important source of power for the mill industry. 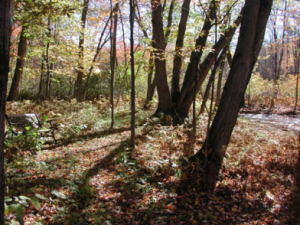 The Lakes Environmental Association offers guided walks on the natural and cultural history along the Stevens Brook Trail throughout the year. Visit our calendar of events for complete program listings. Full Trail map available here.